...well, that was as i far as i got before the computer completely failed. i did a complete reformat this time... fingers crossed! i have a few polishes from Dr.'s Remedy to share with you all, and we are going to kick it off with their Basic Basecoat! (it's a press sample, kindly provided to me for review). 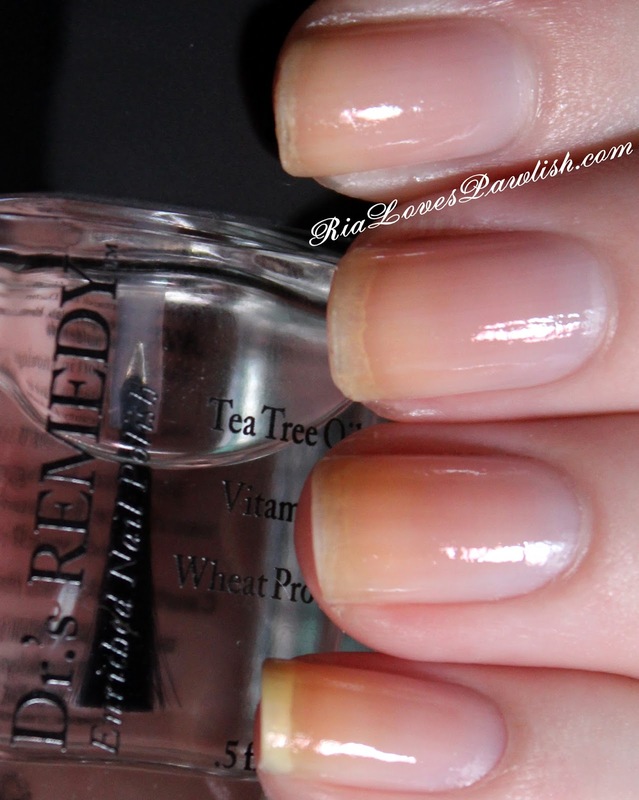 like other polishes in this line, it's enriched with Tea Tree Oil, vitamins, and wheat protein. you can wear it on its own for a subtle shine, or under polish to protect your natural nail. this doesn't have enough hardeners in it for my type of super weak nail, but i love that it's full of great ingredients! here's a look at it on my nails! in addition to having great ingredients such as Tea Tree Oil, vitamins, and wheat proteins, it's free of formaldehyde, formaldehyde resin, toluene, camphor, parabens, xylene, and dibutyl phthalate :) it's also touted to be the #1 recommended brand by podiatrists! you can find Dr.'s Remedy products at http://www.remedynails.com, the polishes retail for $17! also check them out on Facebook at https://www.facebook.com/Remedynails. Thank you for posting this review about Dr.'s REMEDY Basic Base coat. We hope that you and your followers will 'LIKE' us on Facebook. thank you Rachel, i will add the link to the post! Half Moon Mani Using Lauren B. Beauty!